In less than 3 weeks it's going to be Summer and I haven't even posted something for Spring! 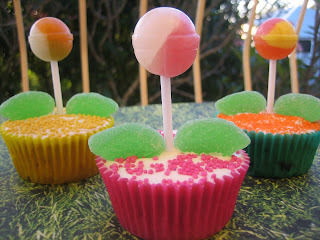 Hopefully i've redeemed myself by making these lovely Springtime Flower Cupcakes. My daughter absolutley loved them and of course choose the pink one. I first saw these somewhere on marthastuart.com. 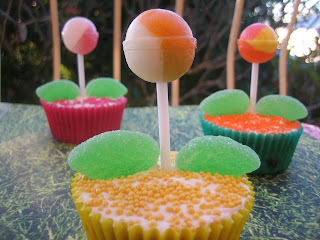 They used a flat lollypop and green sugarpaste for a leaf. 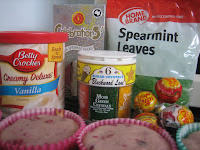 Spread the icing on the cupcake, sprinkle on the sprinkles, push the lollypop down the middle, add 2 spearmint leaves and you've got Springtime Flower Cupcakes. My new fav sprinkles. I tried to make the spearmint leaves stand up a bit but they wouldn't, stubborn little things! This Girl Loves To Talk: Your girls will have fun making them. FHE treat perhaps! Thanks for the easy decorating idea! We'll be using this for our upcoming party. I added this as part of today's daily post. These are so cute! 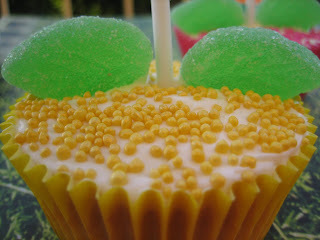 They would be the perfect thing for me to make with my little after school care class.